I bake like it's my job. ← Monday Miscellany: Happy Last Day of March! Before we begin, I need to issue a disclaimer: this chocolate cake will change your life. Seriously. Overall, I’m not a huge fan of chocolate cake because it always seems to be too dry and lack flavor. This cake is the exception. The credit goes to a queen in the kitchen – Ina Garten. Her recipe for Beatty’s Chocolate Cake is the bomb. 1 cup buttermilk – if you don’t have buttermilk on hand, do 1 Tbsp. white vingar in a 1 cup measuring cup, then pour in heavy cream or whole milk until it reaches the 1 cup mark and let it sit for 5 minutes. Give it a stir, then add it to the batter. Preheat the oven to 350*F. Butter and flour two 8-inch x 2-inch round cake pans, or line two muffin tins with cupcake liners. Sift the flour, sugar, cocoa, baking soda, baking powder, and salt into the bowl of an electric mixer fitted with a paddle attachment and mix on low speed until combined. In another bowl, combine the buttermilk, oil, eggs, and vanilla. With the mixer on low speed, slowly add the wet ingredients to the dry. With the mixer still on low, add the coffee and stir just to combine, scraping the bottom of the bowl with a rubber spatula. Sometimes I find it’s easier to stir the coffee in by hand. Pour the batter into the prepared pans. Bake the cakes for 35-40 minutes or cupcakes for 18-20 minutes, until a cake tester comes out clean. Cool the cakes in the pan for 30 minutes, then turn them out onto a cooling rack and cool completely. Let the cupcakes cool for ten minutes before removing them to a wire rack to cool completely. Frost your cake or cupcakes as desired, or just eat them plain. They are THAT good! 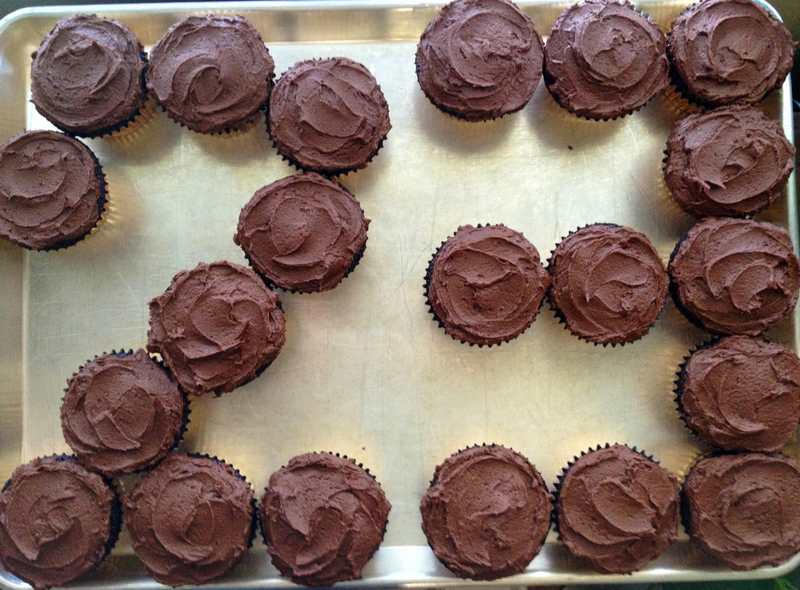 Here are the cupcakes with chocolate fudge frosting that I made for my brother’s birthday last year. Yum.